Geospatial imagery is becoming increasingly present in our daily lives. Beyond the Earth observation industry’s inherent requirement for images used to monitor and perform change detection for different applications, there is a growing interest in consumer-mapping applications made possible through easy-to-use online mapping services such as Bing Maps and Google Earth/Maps. In a recent Nielsen survey of more than 4,200 users, Google Earth/Maps trailed only Facebook as the most widely downloaded application, with Bing Maps close behind and gaining ground. Accordingly, the demand for high-quality, up-to-date imagery is driving the requirement for both cameras and software to capture and process this data. 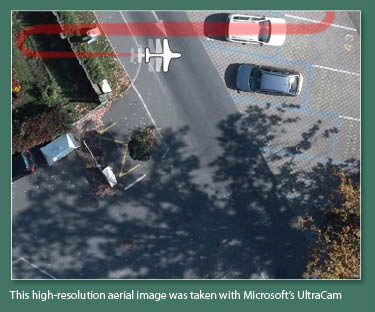 In 2010, hundreds of aerial cameras are recording high-resolution, multi-band imagery, resulting in hundreds and thousands of individually captured frames that are typically 500 to 700 megabytes or greater. Collecting multiple terabytes of data in one day is now common practice. All of this raw data must be orthorectified, color-balanced, mosaicked, and tiled to create useful imagery that can serve as the new basemap in consumer mapping platforms, among other applications. Simply put, data is being acquired at a faster rate than it can be processed. In a crowded, highly competitive market, imagery providers are looking for the most cost-effective ways to produce high-quality output as quickly as possible, with market pressure on camera operators to produce mosaics rather than uncorrected imagery alone. One solution is the GXL Aerial (GXL-A), an automated ortho- and mosaic-processing software system for high-performance throughput and quick project turnaround. 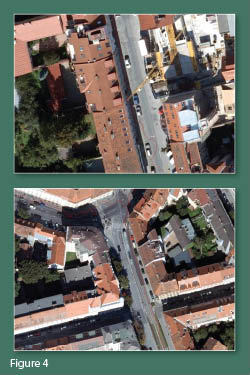 PCI Geomatics developed GXL-A technology in response to this need for high-speed processing of digital aerial photos. 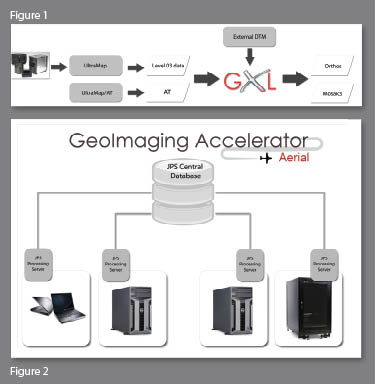 GXL-A is based on PCI’s GeoImaging Accelerator technology that uses low-cost, off-the-shelf hardware combined with automated and distributed workflows. Faced with the need to increase processing power to boost throughput, PCI looked to the computer graphics industry’s use of graphical processing units (GPUs). A GPU is a microprocessor that offloads and accelerates 2D/3D image processing from the microprocessor, whether it is for climate modeling, medical imaging, or—in the case of PCI’s GXL technology—automated workflows for orthorectification and mosaicking. Modern GPUs are extremely efficient at manipulating computer graphics, and their parallel structure makes them more effective than general-purpose CPUs for a range of complex algorithms. This in turn makes them perfect for remote-sensing and image-processing applications. GXL-A is simple in its design and purpose, which is to convert Level 3 aerial photo data into tiled ortho imagery and information into products. Its lightweight, web-based graphical user interface allows a user to automatically ingest, process, output, and monitor hundreds and thousands of images in an automated manner. Central to the GXL-A is the job processing system (JPS) that breaks a large job into smaller parts that can be distributed to resources available on the GXL-A system. The JPS monitors the available processing capacity on all nodes to allocate processing jobs to resource as they become free. By executing the work in this distributed environment, the GXL-A is able to complete processing much faster than traditional sequential production environments. The core of the system performs the most common operations, including orthorectification and mosaicking with automated color-balancing, seamline selection, and hyperthreaded tiling operations. The output is ready to be used, distributed, or delivered in several standard formats (e.g., GeoTiff). The GXL-A processing for UltraCam imagery extends the UltraMap workflow to allow the processing of mosaicked products with full automation (Figure 1). Manual quality control steps that are usually required for product validation can be added. This integrated workflow takes raw data from UltraCam, processeses it to Level 3 by UltraMap, and creates a final ortho mosaic using GXL-A. Here the digital terrain model (DTM) is provided externally, as are the Level 3 Tiff and AT inputs from UltraMap. The GXL processing architecture (Figure 2) is designed so that multiple nodes are connected to handle processing in a distributed manner. This flexible, scalable architecture can be expanded with additional processing nodes to handle increased throughput. Even high-volume mosaic throughput (1000+ images per day) can be achieved and tailored to different operational requirements. Bing Maps uses a combination of satellite and aerial photography to generate multi-resolution imagery-based maps. 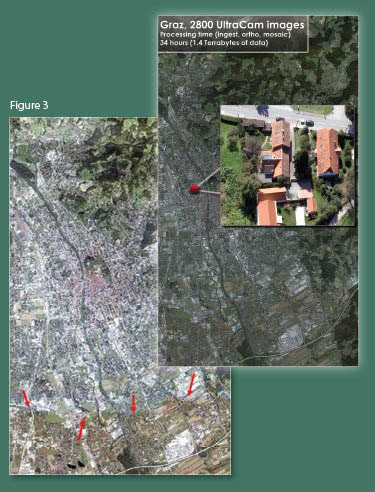 In one case study, the challenge was to process more than 2,800 UltraCam images of Graz, Austria at 7.5cm resolution in less than one week. Initial color balancing was applied using the UltraMap software and converted to UltraCam Level 3 RGB products. Using a 10cm DTM supplied by the client, PC I processed this data in under 34 hours and output 90 750m x 750m high-quality tiles using a distributed GXL-A production system. The positional accuracy of the output was verified using independent control and found to be within 1 to 2 pixels RMS (15cm or better). The thoughput achieved using GXL-A in this example represents processing times of roughly 30 seconds per scene and is significantly faster than any previous processing workflow. Using a competitor’s product, the best results to process the same dataset required a minimum of seven days; the only way to create a distributed environment would be to add additional licenses and machines, creating significant challenges for data management and project monitoring. A neighborhood color-balancing algorithm with hotspot normalization was applied to the dataset. Neighborhood color balancing adjusts the pixel values within images to be similar to those of its neighbors, and hotspot normalization is used to remove variations in image brightness due to r eflections or overcast conditions. Although subtle, these small variations in brightness within each image can affect the seamless integration of the images into a mosaic. Figure 3 shows a 2800-image mosaic of UltraCAM X imagery; on the left is with no color balancing and on the right is with color balancing in GXL processing. Together the resulting mosaic is far superior to any mosaic using Level 3 output alone. PCI has developed a variety of auto-cutline generation algorithms. As shown in Figure 4, we used the Edge cutline method to make the seams between images less visible and ensure that selected features are consistent in tone and texture. Features that display clear boundaries provide a natural camouflage for the seam. As the cropped images are added to the mosaic, the data in overlapping areas is covered by the most recent addition. Areas where several images overlap provide more opportunities to find the best location for the cutlines. In urban areas, automatic cutline generation follows linear features such as roads. Combined with strong color balancing, the result is a seamless mosaic that requires less manual editing and QC. Today high-resolution imagery is being acquired very quickly and in large amounts, and the market needs it to be processed quickly and inexpensively. Companies such as PCI Geomatics are combining their expertise in image processing with innovative uses of new technologies to effectively respond to these increasing demands in the aerial market. David Piekny has more than 10 years of experience in the geospatial industry and presently manages the GXL product line for PCI Geomatics, a developer of hardware/software systems for geo-imaging solutions headquartered in Toronto, Canada. Doug Stiff is an application specialist with PCI Geomatics and also has more than 10 years of experience working in the geophysics and geospatial industries.